The Chancery Clerk Wears Many Hats. The Chancery Clerk is the custodian of public records. This office receives and records warranty deeds, quitclaim deeds, powers of attorney, etc. As Clerk of the Chancery Court, the Chancery Clerk maintains the Court docket and files all records of the Court. The Chancery Clerk serves as the Clerk of the Winston County Board of Supervisors and prepares the minutes of each board meeting, assists the Board in equalizing the assessment rolls of real and personal property and processes Homestead Exemption applications and sends the results to the State Tax Commission. The Chancery Clerk is the Auditor and Treasurer for the County and prepares a monthly claims docket to be approved by the Board of Supervisors, as well as receiving the monthly settlements from other offices. The Chancery Clerk collects delinquent land taxes, serves as theYouth Court Clerk, dispenses traffic and DUI tickets for the Sheriff's Department, records military discharges and processes all phases of drug/alcohol and mental commitments. Beginning in 2010, the Local Government Records Office of MDAH began a multi-year project to assist and advise county governments in managing their earliest records. 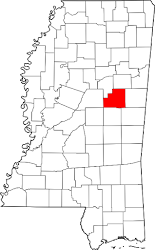 One component of that project was to inventory the pre-1920 records in Mississippi's oldest counties. The information in these tables was accurate as of the date of the inventory and therefore may not reflect the records currently in the custody of a county. In each listing, the data are arranged alphabetically by records series title and then by the earliest data of each volume. MDAH uses common names for most records titles, but titles may vary between counties. Additional explanatory information may be included in the notes column.